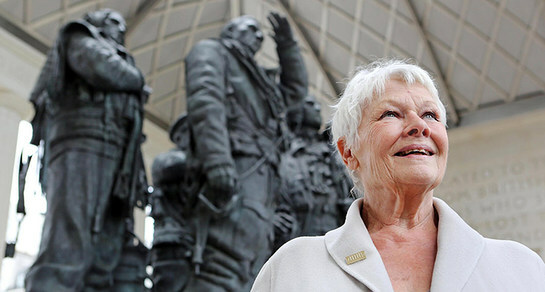 Dame Judi Dench has agreed to become a Patron of the ‘Bomber Command Upkeep Club’, in order to help honour the bravery of the Bomber Command and the sacrifice of the 55,573 men who gave their lives for the freedom of others. Launched by the RAF Benevolent Fund, the club is named after Barnes Wallis’ famous bouncing bomb, “Upkeep”, used in the great Dambuster Raid of May 1943. Dame Judi Dench said: "I am delighted to become a Patron of the Upkeep Club. The Bomber Command Memorial, which so nobly honours the sacrifice of the fallen aircrew, has already become a place of pilgrimage for relatives and former acquaintances of the ‘Bomber Boys’ lost during the Second World War. To learn more about how you can help, visit the Upkeep Club webpage.